Warren Coakley says you shouldn’t underestimate the power of Facebook, after someone who saw a status update about the theft located the stolen vehicle. Warren's car, a Dolphin grey Audi A4. A DUBLIN MAN HAS found his stolen car after posting messages on Facebook appealing for information. 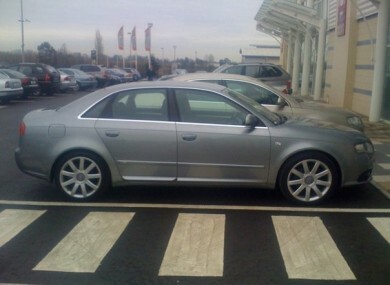 The grey 2005 Audi A4 was stolen from outside the home of Warren Coakley, 34, in Tyrrelstown on 19 January. He was due to attend a job interview on the morning of the theft, but was forced to cancel it. Coakley told MotorCheck.ie he had been loading clothes and bags for two of his children into the car when he turned back into the house to get his baby from his wife to put in the car. When he came back outside holding the baby, he saw a stranger inside the car. The driver reversed away, striking Warren in the side as they drove off. He said his 12-year-old son was so traumatised by the theft that he began staying with his grandparents and didn’t want to come home. Coakley emailed friends and contacted gardaí and radio presenters Joe Duffy and Hector Ó hEochagáin for help in tracing the vehicle. A friend posted an appeal for the car on Boards.ie and Coakley put a message on Facebook asking people to keep an eye out. The car was spotted in Mulhuddart Woods, not far from where it had been stolen, on 24 January by someone who had seen a Facebook status mentioning the vehicle. They contacted Coakley, who in turn called the gardaí. He said the gardaí were shocked he had managed to locate the stolen car himself, especially through a social networking site. Coakley told the Irish Sun that he doesn’t know if any of the contents are still in the vehicle as it has been taken by the gardaí for fingerprinting, but he said people should “never underestimate the power of Facebook”. Email “Dublin dad gets car back through Facebook”. Feedback on “Dublin dad gets car back through Facebook”.